We are open every day of the week, and at lunch the kitchen remains open until 2.45 pm. Any occasion you want to celebrate, whether it’s a luncheon, a feast for a baptism, a communion, or a party for a birthday or an anniversary, a corporate or group dinner, entrusted to the impeccable organization of the Restaurant Pizzeria San Francisco in Cala Gonone. 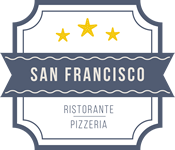 or send an email to info@sanfranciscoristorante.com or to pietro.sale76@tiscali.it to better organize your special event.